Another year has come and gone, whether we want it to or not. Such is the nature of time. 2013 was quite a year, for me. I finally met not only a real author for the first time, but my favorite author in the world, and I enjoyed it! I earned my Associates of Science degree in Mathematics at the community college, and transferred to the University, where I am double majoring in Computer Science and Mathematics. I am loving all of my classes, and quite ready for the spring semester to start. My grades have stayed where I want them. I have even made some friends, for the first time ever. We fell in love; she fell out of love. I decided to read every Hugo and Nebula award nominated and winning novel, and have started on my epic quest to obtain them all. I discovered and read many, many new authors–at least, new to me. Old news to many of the more well read in the genre. By the way, here’s my current bookshelf, to-read. 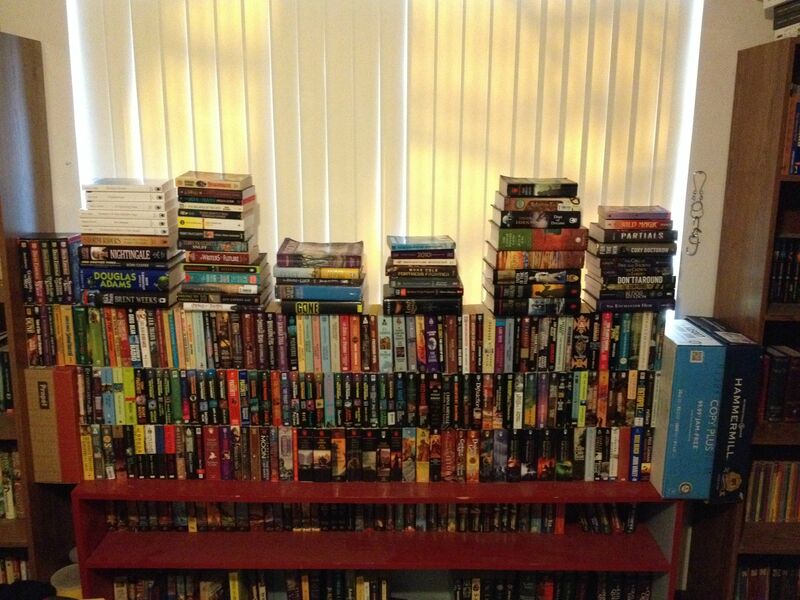 Everything on top (3 rows + stacks) has not been read yet. Resolution 2 isn’t much of a shocker. I’m going to write every day this year. So far I’m going strong (with 1k+ words every day), and I see no reason to stop. I managed it for most of the days last year, and I can again this year. Resolution 3 is to do some significant revisions to at least one of the novels I have written. Right now, there’s two I have completed, and one more I’m working on. This probably won’t happen for a while, but at some point I will do this, and I’m talking about serious revisions, such as taking out or inserting new chapters, rewriting entire scenes, changing characters, and so on. I want to try to take a long work that I’ve completed and make it significantly better. Resolution 5 is to submit short stories, at least one per month. I kind of fell off the band wagon with this at the end of the year, and didn’t submit anything in November or December (Though I did submit a few and get my first rejection emails before that. ), but I’m going to submit something this month. Yay for more rejections. Along with this comes writing more short stories, something I haven’t done since October. Resolution 6 is to get some kind of paying job. I need it, honestly, to be able to afford school and my reading habits. I’ve applied for a job assisting in classes at UT, but if I don’t get that, I’ll look for a tutoring job of some sort, something I can do to earn a good bit of money on the side. I have many other small goals for myself, and I’m not ignoring those, but the six items listed above are my major resolutions for the year. What are your resolutions?